It feels so good when someone thanks you for something you’ve done. That means they appreciate your efforts and what you mean to them. Appreciation is Kiddie Academy® Educational Child Care’s featured Character Education value for April. We’ll celebrate Earth Day in our Academies on April 22 by creating a list of the many things the Earth provides. We point out how thankful we are to the Earth for providing food, water, air, and all the beauty that we see every day. We also plant flowers and trees with our children and families. 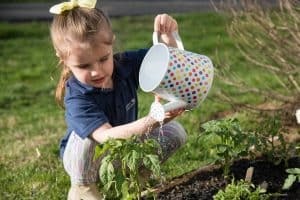 You can do a similar Earth Day planting project at home with this Milk Carton Garden Houses activity from our partners at PBS Parents. Children look to adults as models for behavior. That’s why at Kiddie Academy, we show and model appreciation every day. Our teachers show appreciation for children’s actions throughout the day. When they’re good listeners, as they clean-up, and transition orderly from one activity to the next, teachers show their appreciation by a positive remark, giving out stickers, or assigning them as leaders. We encourage children to recognize and appreciate the efforts of their peers often. Teaching children about appreciation shouldn’t be limited to their time at Kiddie Academy. There are simple things you can do at home to make sure the learning continues. Remember to thank or praise others for doing nice or helpful things so that your children see you express your appreciation. Take time to discuss things that you appreciate, like your home, which provides shelter from the elements.